Colonial Charleston’s Biggest Literary Mystery Is Solved! Candidly, the name in the obituary meant nothing to me in and of itself. However, I knew that I had to explore it to see whether that person might have been The Humourist. Luckily for me, I hit pay dirt. All of the clues—all the patterns—that I had found in the essays lined up perfectly with everything that I was to find out about the ingenious person whose obituary I had stumbled upon. Thank you for such a warm welcome. You make me feel quite at home. I want to extend my deepest thanks to the Society’s “Special Events and Programs” Committee for inviting me here as well as for their impressive publicity promoting my work on The Humourist. Actually, I was blown away earlier this week when I went to the Society’s web site and saw: “Join us for Colonial Charleston’s Biggest Literary Mystery!” Thank you! I can’t begin to tell you how thrilled I am to be with you this evening. I’m thrilled for two reasons. First, libraries and librarians hold a special place in my heart. Before I became a professor of English at Lord Fairfax Community College in Virginia, I worked for twenty five years at The Library of Congress where I fell in love with books, where I fell in love with research, and where I fell in love with life-long learning. And simply because we are all gathered together this evening, I know that libraries, librarians, and lifelong learning are important to you as well. Here’s the second reason why I’m thrilled to be with you. For me, this is a homecoming of sorts. My work on The Humourist—your very own Humourist, your very own writer, living right here in Colonial Charleston—actually began right here in The Charleston Library Society in 1973—forty years ago—when I was a doctoral student at The University of South Carolina, taking a Colonial American Literature class with Professor Calhoun Winton. I remember the details well. I was reading Leo LeMay’s Bibliographical Guide to the Study of Southern Literature, and in it he noted that The Humourist essays were of such high caliber that someone needed to edit them, publish them, and identify the author. I was intrigued and challenged. The essays appeared originally in the South Carolina Gazette. Only one complete run of the newspaper exists, and it’s housed right here in the Charleston Library Society. So for an entire semester, I traveled here from Columbia on weekends where inside these walls I read and studied The Humourist essays and came to agree with LeMay: these were some of the best Colonial American essays that I had ever read. However, I didn’t do anything further with Professor Lemay’s challenge, except to file it away in my mental storehouse of “one-day, some-day” ideas to be tackled further down the road when the time was right. Instead I went on to edit the letters of New England writer, Mary E. Wilkins Freeman, and to publish them as The Infant Sphinx: Collected Letters of Mary E. Wilkins Freeman. Instead I went on to pursue a fabulous career at The Library of Congress. Now, four decades later, I discovered to my surprise—and, candidly, to my joy—that no one else has accepted Professor Lemay’s challenge. The Humourist essays that he lauded have remained unedited, unpublished, and the author unidentified. Now, four decades later, as a 2012-2014 Chancellor’s Professor in the Virginia Community College System, I have the opportunity—a second chance, if you will—to be the student who takes Professor Lemay’s idea and runs with it. I have the opportunity to be the student who brings these essays to full light. I have the opportunity to be the student who sees to it that these essays take their rightful place in the American literary canon. And I have the opportunity to be the student who solves the mystery: Who wrote those essays? That why I’m here tonight: to share with you what I have been doing with these essays during the last year, and—based on a preponderance of textual clues in the essays—to announce for the first time ever the author—the man who up until tonight has been Colonial Charleston’s biggest literary mystery. My goal is a simple one: make these essays available not only to students, professors, and scholars but also to the reading public at large. Last fall, I launched a blog titled “The Wired Researcher,” and in it I have shared with students, faculty, and everyone who is interested my personal research experiences—“live,” from start to finish: my work, my methods, my discoveries, my challenges and frustrations, and my joys. Let me share with you the general flavor and background of The Humourist essays. It is necessary to premise that I am a Man of a peculiar odd Way of Thinking, and I shall consequently make myself very merry at the Particularities of other People. Thus much for Preface. The Humourist will never pester the World with incoherency or unnatural Occurrences, under the specious Pretence of painting true Life or copying after Nature. Thus much for Self-Praise. The utmost Aim of my Compositions shall be directed to please; and if I now and then chance to tour uncommon Heights, the World must understand that I am improving the Method of Writing, and that my Habitation is in the Air. I am an aerial Spirit; and as an inducement to the World to Read my Paper, they may shortly expect a Present of my Picture, which, like the Statue of Mercury in the Fable, shall be thrown into the Bargain. The Humourist is become an Invalid, and as he loves Retirement must quit the foolish busy World, and please his vacant Hours with the secret Satisfaction of having intentionally displeased no one. As a professor of American Literature, I can tell you—and, for now, you’ll have to take my word for it until you read the The Humourist’s essays in my blog: at this point in America’s development—1753/1754—we simply don’t have essays of this caliber, even in New England, and we certainly don’t have true essays of this caliber from this time period in the South. The Humourist is a new voice, a fresh voice who deserves to be read widely, who deserves to be celebrated widely, and who deserves to be anthologized widely so that future generations are mindful of the important contributions that he made. The work that I have been doing with The Humourist essays has offered several challenges. The first challenge relates to editing and annotating a collection of essays that exists in the only surviving copy of the South Carolina Gazette housed here in the Charleston Library Society. Fortunately, and with Rob Salvo’s help—and before him, with the help of Carol Butler here at the Society—I have completed that task, and I have made a preliminary version of the essays available in my blog, The Wired Researcher. Formal publication will follow in a year or two. The second challenge relates to conducting the authorship study—the challenge of solving this literary whodunit mystery! I’ve done so, in large part, simply by giving the essays what is called a “close-reading.” This is an ancient method, going all the way back to Roman literary critic Quintilian. (The Humourist himself would be delighted because he, too, was familiar with Quintilian, quoted him on at least one occasion, and knew the value of paying attention to language and all of its details! That’s what I’m doing: paying attention to details—cataloging them, if you will, and cross referencing them to establish patterns. For the last few months, I have shared my “close readings” with my blog audience in a weekly post called “Controlled Revelation.” Clearly I had to control how much I divulged about the author in any given week because I didn’t want my readers to solve the literary mystery prematurely! So, week by week, I’ve analyzed the essays and revealed—in a controlled manner—what I have found. Let me share with you some of the highlights of those clues—the patterns—that have surfaced. Again, keep in mind that these are simply highlights. You can read the full discussion in my blog. Here are some broad patterns. The Humourist knows the classics including: Aristotle, Virgil, Horace, Longinus, Quintilian, Dionysius, Plutarch. The Humourist knows literature and quotes from: Shakespeare, Milton, Spencer, Samuel Butler, James Thompson, Edward Young, Samuel Garth, Fielding. An antique whole Length of Signior Adam. Notice his use of the Italian word Signior. Later on you will see why it is important. Several half Lengths of Nimrod, Alexander, Julius Caesar, Nero, Borgia, Lewis 14th, Charles 12th. Again, keep in mind his reference to Borgia. Later on you will see why it is important. Above 500 grotesque Pieces (several in Chinese Taste) of which the Humourist Family are generally great Connoisseurs: Many of these are Drawings and Etchings, and give great Light into Antiquity, and a Display of the unaccountable Humours of the Ancients. In addition to his in-depth knowledge of painting and drawing, The Humourist knows about Egyptian mummies: In one of his essays, he writes a letter to himself under the pseudonym Peter Hemp. In the letter Peter Hemp makes a most interesting comment about Green Tar, who, he maintains “boasts of preserving the most antient Egyptian Mummies down to the Present Time.” I am intrigued that The Humourist would mention something as esoteric as the preservation of Egyptian mummies. We’ll come back to it. And, as might be expected, The Humourist knows, loves, and promotes Colonial Charleston and Colonial South Carolina and makes several references to the General Assembly, almost as if he had insider information about the Assembly’s undertakings. Later on you will understand why his references to the General Assembly are important. It is evident, that the Ancients looked upon those Customs as promotive of the social Duties, and as so many Obligations of the Performance of them. I am sorry to say, that modern Elegance is endeavouring to suppress these noble Emanations, but I am far more grieved to own, that such Virtues are incompatible with modern Graces. It is with Sincerity I offer my Thoughts on this Subject, tho’ far more unnecessary in this Place (than in my others) where so noble a Generosity, joined with an hospitable Dignity, prevails. 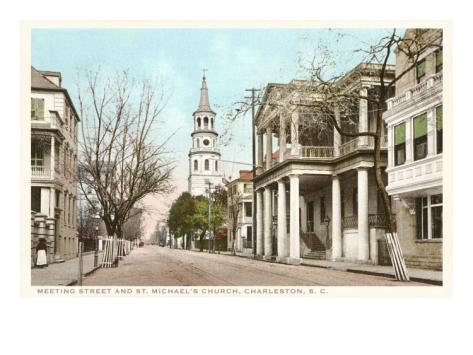 In another essay he discloses the general location of where he lived in Charleston, observing that he is a “Man of Penetration, and can, with surprising Discernment, see a Church by Day-Light.” In fact, The Humourist had a home on what is now Meeting Street and indeed he would have been able to see St. Michael’s Church. Also, the essays show The Humourist to be a promoter of South Carolina. He recognized the challenges facing the Colony of South Carolina in terms of industry, trade, manufacturing, and social issues, and he addressed them. Nothing adds to the Wealth of a People and encourages Industry, than the Exclusion of foreign and Use of their own Manufactures. All wise Nations and judicious Subjects, industriously avoid the purchasing of that from abroad, which they can be well supplied with at Home. I confess myself quite unskill’d in Trade, therefore hope, the above Hints will be considered as arising from the Love of my Country. I have a Fortune sufficient to purchase Wheat-Flour, yet chuse to eat nothing but Rice, because it’s of our own Growth; nor will I touch even a Piece of Johnny-cake, except made of Wheat-Flour sent from the Back-Settlements; all the Furniture of my House, etc. is of Carolina Make; so is my riding Chair, and most of my Cloaths; and Mr. Scott’s Beer (as soon as I saw his Advertisement) had the Preference to all foreign Liquours, and is become my constant Drink. I wish every Lady in the Province was of my Humour; what a Number of Dollars should we then have at Command more than at present! But, as the Reasonings of private Persons can seldom prevail against public Prejudice, I would ask your Advice, if it would be improper to recommend myself to the General Assembly, for their Encouragement and Support, as their Notice of me would bring great Numbers of British Subjects annually to settle your back Countries, would liquidate the Public Debts, and put your Currency on a Par with the Cash of your Mother Country. On further Enquiry, am told by Mr. Pot-Ash, Merchant, that He is of the same Sentiments with myself; and that we both should meet with Encouragement among you, had you any Person well skilled in bringing us to hear: But the Process is so easy, and the Profits so considerable, that it’s amazing, you think it not worth while to send an ingenious Person to see how we are managed. Writing under the pseudonym of Peter Hemp, the Humourist proposes that Indigo, Pot-Ash, Green Tar, and Hemp can live in one house along with Rice. Building a bridge over Ashley-River. Of the proposed bridge, Urbanicus notes—if such a bridge is to be built, “to be sure there must be an Act passed for it. It would really be a good Thing: And, if you, Mr. Humourist, are in the A—-y, we, and Thousands of others, hope you’ll befriend such a Bill.” In terms of the word “A—-y,” The Humourist is using a convention standard that writers often use: omitting letters from a word to suggest that they dare not use the word itself but providing enough letters that everyone would understand. Thus, that part of the sentence becomes: “if you … are in the Assembly, we and Thousands of others, hope you’ll befriend such a Bill.” Again, remember the General Assembly. So, I’ve shared with you highlights—and they are just that: highlights—of the clues that I found in the essays, and I have shared brief selections from the essays. The HUMOURIST is become an Invalid, and as he loves Retirement must quit the foolish busy World, and please his vacant Hours with the secret Satisfaction of having intentionally displeased no one. He thanks the Publick for having generously construed these Papers; but, for some private Reasons, is under a Necessity of declaring, that he will never more (either under this or any other Title, or on any Pretence, or on any Occasion whatsoever) enter the Lists of Authorism in this Province. I was floored—no, flabbergasted—to see these wonderful Colonial American essays end so abruptly. And what was I to make of this retirement notice? Was it true? Had The Humourist become an invalid, really? So, it was from that research perspective that I kept exploring the South Carolina Gazette. Two feet to the left and two feet to the right, if you will. I re-read the entire newspaper for 1753 and 1754, up to The Humourist’s Final Notice. Then I decided to keep reading. “What if, “ I asked myself, “what if he really had become an invalid? What if he died? Maybe the Gazette would carry an obituary.” I knew that was a long shot because based on my exploration of the Gazette for this period, obituaries did not appear that often. I’ll stop reading the obituary at this point—even now, I want to control the revelation of The Humourist’s identity—I’ll save his name until the very end! Keep in mind that mortification is a medical term that means gangrene. Mortification occasioned by the cutting of a corn. So, indeed, The Humourist had become an invalid when he posted his Retirement Notice. And even though his departure from the New World was not a glorious one, whoever wrote his obituary notice knew that he was Ingenious. Yes, indeed. We see that trait in all his essays! Candidly, the name in the obituary meant nothing to me in and of itself. However, I knew that I had to explore it to see whether that person might have been The Humourist. Luckily for me, I hit pay dirt. All of the clues—all the patterns—that I had found in the essays lined up perfectly with everything that I was to find out about the ingenious person whose obituary I had stumbled upon. Obviously, some of the individual clues that I discovered in The Humourist essays might point us to any number of learned and sophisticated people living here in Colonial Charleston. But when all the clues in the essays—including the esoteric ones—point to one person—and to one person only—it provides rather irrefutable evidence that we have found our author. Let’s do a crosswalk comparison. Subsequently, and for a good number of years he achieved considerable distinction as an operatic tenor. From 1716-1719, he made operatic appearances in Italy. He returned to England in 1719 where a benefit concert for him was held at the Lincoln’s Inn Fields, London. He continued to be involved in opera and the theater, though with less and less frequency, until 1741. During this period he wrote what appears to be his only play: Lupone, or the Inquisitor: A Comedy, published in 1731. Remember: the Humourist essays show extensive knowledge of the theater and of drama. Aside from being involved in theater, the ingenious person whose obituary I had stumbled became interested in antiquarian studies and decided to investigate the Roman antiquities of Scotland and northern England. His antiquarian explorations occupied his focus between 1723-24. In 1725, he was elected to the Society of Antiquaries and to the Society of Roman Knights. In the next year he published his Itinerarium Septentrionale: or, A Journey thro’ Most of the Counties of Scotland, and those in England. In two Parts. The Whole Illustrated with Sixty-Six Copperplates. The work is considered to be a “record of great contemporary importance and some lasting value.” He continued his antiquarian studies concentrating on “Roman sites of the lowlands,” on the Agricolan advance, and on the Antoine Wall. In the latter exploration, he was accompanied by James Glen, who was provost of Linlithgow and also an antiquarian. In 1729, he published The Lives of Pope Alexander VI, and His Son Caesar Borgia. (Pope Alexander VI and Caesar Borgia were Italian.) In 1730, appeared his published A Compleat History of the Antient Amphitheatres, More Particularly Regarding the Architecture of these Buildings, and in Particular that of Verona. And in 1733, he translated The Book of Common Prayer into Italian. Remember: the Humourist essays show extensive knowledge of history and “the antients,” and the essays make specific reference to Borgia. Also, do you remember when I mentioned that The Humourist essays show knowledge of Egyptian mummies? Well, the person whose obituary I had stumbled upon published two essays related to Egyptian mummies. The first in 1737 titled An Essay towards Explaining the Antient Hieroglyphical Figures, on the Coffin of the Ancient Mummy Belonging to Captain William Lethieullier. The second, also in 1737: An Essay towards Explaining the Antient Hieroglyphical Figures on the Egyptian Mummy in the Museum of Doctor Mead, Physician in Ordinary to His Majesty. The person whose obituary I had stumbled upon also served for a short time as secretary to the Egyptian Club. Finally, in 1741 the ingenious person whose obituary I had stumbled upon left the Old World and came to the New World as secretary to his old friend James Glen who was now the new Governor of South Carolina. From then until his death in 1754, the ingenious person whose obituary I had stumbled upon served—here in Charleston—as Clerk of His Majesty’s Council. Additionally, the ingenious person whose obituary I had stumbled upon served for a while as Registrar of the province and as Constable—a justice of the peace. (Remember: The Humourist mentions “constables” in his essays.) He prospered here. He owned land in Charles Town itself as well as in Ansonborough, profitably developed for houses. He became a member of the St. Andrew’s Society and “associated with the leading professional men of the province.” Finally, he wrote about colonial South Carolina, and in a description that he sent to the Royal Society he spoke of “its admirable fertility, and wonderful produce of unnumerable curious and useful things—the vine, wine, sesamum, oil for soap, cotton, mulberry, silkworms […] hemp, flax, potash, etc. etc. But after all this profusion of nature’s bounty, the inhabitants … made no profit or improvement in any one article for commerce, employing themselves wholly in the culture of rice.” Remember: in his essays, he specifically advances the notion of buying Carolina products instead of importing foreign commodities , and on several occasions he makes the point that hemp and potash and indigo can live in the same house with rice and suggests such a proposal be taken to the General Assembly. Finally, the Last Will and Testament of the ingenious person whose obituary I had stumbled upon contains several bequests along with a directive that reinforce my identification of the author of The Humourist essays. These bequests deal specifically with paintings and drawings. I give, devise, and bequeath unto the Honourable Hector Berrenger De Beaufain, Esq, his picture, portraiture, or effigies by me [ …] painted, drawn and represented as aforesaid. I give, devise, and bequeath unto the Reverend Mr. Heywood, his picture, portraiture, or effigies by me [ … ] painted, drawn, and represented as aforesaid. I give, devise, and bequeath unto my son Alexander Gordon, my own picture, together with all and singular the paintings, views, and other representations by me […] painted, drawn and represented. Remember: the Humourist essays show extensive knowledge of drawing and painting. Finally, the directive in The Last Will and Testament deals with an unpublished manuscript about Egyptians. Remember: the Humourist essays show extensive knowledge of history and “the antients,” including a reference to Egyptian mummies. I think that it is abundantly clear: all of the clues—all the patterns—that I found in the essays line up perfectly with everything that I found out about the ingenious person whose obituary I had stumbled upon. Of so much warmth and light. To finish clear at eve. I daresay that the intensity will not come my way again for some while, and, perhaps that’s a good thing: I’m wired enough already! This week we’ll apply our close-reading strategy to The Humourist’s essay of January 8, 1754. You might want to click on the link and take a moment to revisit the essay. To say that he’s stretching pseudonymity is an understatement, yet I find it amusing. To be certain, the humor in this essay is subtle, but it’s there, nonetheless, and we have not seen it before. I am intrigued as well by the statement at the beginning of the essay that “you are a Man of Penetration, and can, with surprising Discernment, see a Church by Day-Light.” Until last week’s research trip, I didn’t know what to do with that comment. Now, however, having had access to the Last Will and Testament of the person I have identified as the Humourist, I understand. He owned property and had a home on what is now Meeting Street, and, indeed, he would have been able to see St. Michael’s Church at the corner of Meeting Street and Broad Street. St. Michael’s Church, Charleston, S.C. This strikes me as a rather significant clue. Finally, a new Humourist dimension emerges in this essay. I noted in an earlier Controlled Revelation that The Humourist was a bibliophile. I find it interesting in this essay that he shows his knowledge of children’s literature. He mentions “Jack the Giant-Killer,” an English fairy tale from the early eighteenth century. Also, he mentions The Circle of the Sciences, a series of “instructional books for young boys and girls. The books were edited/published between 1744-1748 by John Newbery, considered to be the “Father of Children’s Literature.” He was so important to the creation and marketing of children’s books that the American Library Association awards the Newbery Medal annually for the most important children’s book published in the previous year. This week, then, we can see that The Humourist does have a sense of humor. We can see that he lives close enough to St. Michael’s that he can see it by daylight. And we can see that he has some knowledge of children books, including contemporary ones. Week by week, The Humourist.’s profile (like his Aerial Mansion) is becoming “fitted up,” and before the end of summer it will be complete!